The IWC-2-2 internal wire clip set allows our PVS-IS2 and PVS-RS2 vent screens to be securely installed inside a standard 2″ PVC hub or coupling without the need of a drill, adhesive or any additional hardware. Additionally, our internal wire clips allow for future serviceability including seasonal vent screen changes. Our internal wire clips are made of 304 stainless steel and may be reused for many years. The IWC-2-2 internal wire clip set includes two reusable wire clips that are designed for use with our PVS-IS2 2″ insect vent screens and PVS-RS2 2″ rodent vent screens. 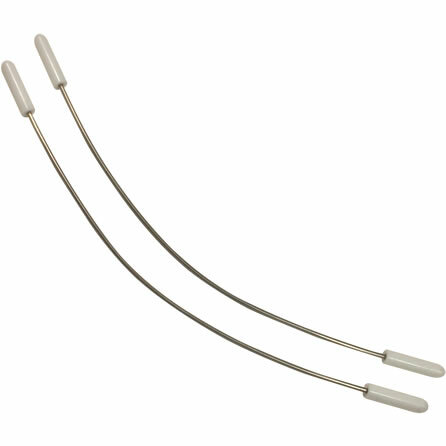 Each internal wire clip is made of 304 stainless steel, with high temperature silicone tip ends, and is designed for many years of trouble-free use. When properly installed, one IWC-2 wire clip is all that is needed to adequately secure our two inch PVS series vent screens inside a standard schedule 40 and 80 2″ DWV PVC hub or coupling that has an inside diameter of 2.375″. Our internal wire clips are safe to use on both intake and exhaust vents, which are commonly used for modern day high efficiency boilers, furnaces and hot water heaters. Since we utilize American grade stainless steel, no unsightly stains from corrosion will appear even after years of use and repeated exposure to mildly acidic exhaust gas discharged from condensing vent terminations. Since every PVS-IS2 and PVS-RS2 we sell ships with a single IWC-2 internal wire clip, please only purchase these if you want spares, need to replace those from a prior order or wish to double up the wire clips for twice the holding strength. One internal wire clip is all that is needed to install our 2″ PVS series vent screens, even when they are installed into a 90° hub pointed straight down. Please note the IWC-2-2 internal wire clip set is not designed for use with our SVC-IS2 2″ PVC insect vent cap or our SVC-RS2 2″ PVC rodent vent cap as those models include stainless steel fasteners to attach the caps directly over standard 2″ PVC ventilation and drainage pipe ends.